The Fraunhofer Institute for Integrated Circuits IIS announces its first JPEG XS codec implementation for video production at the NAB Show in Las Vegas from April 9-12 2018. The coding specialists of Fraunhofer IIS will demonstrate the JPEG XS codec as an input format for post-production in a software plug-in for Adobe® Premiere® Pro CC with real-time playback capability of 4k60p UHD video. With ever-increasing amounts of data from higher resolution and dynamic range in videos, long-distance transmission from coax cables in studios will soon become outdated. At the same time, production companies and studios are trying to substitute specialized cables and switches for video transmission by commercial off-the-shelf (COTS) components with the introduction of simple and cost-effective IP transmission over standard Ethernet infrastructures. JPEG XS in general is a new codec under standardization by ISO/IEC SC29 WG1 (‘JPEG committee’) for IP workflows in studio environments, local video networks and VR/AR applications which allows transferring high-resolution video data over standard Ethernet or other wired connections. The codec is optimized for the use with mezzanine compression when high image quality data has to be transferred via limited bandwidth or has to be processed with limited computing resources. The Fraunhofer IIS JPEG XS development can be used for the lowest complexity and platform-independency applications at compression ratios from 2:1 to at least 6:1. JPEG XS enables a simple integration in all existing hardware or software systems, such as cameras and extenders, due to its high granularity of parallelism in the algorithm. The codec is designed to take advantage of the SMPTE 2110 transmission layer system over IP. 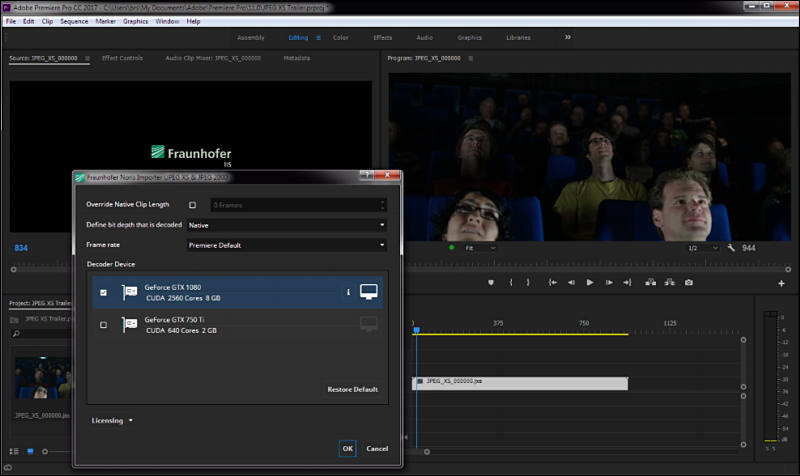 At NAB Fraunhofer IIS will demonstrate the JPEG XS codec as an input format in a software-plugin for Adobe Premiere Pro CC for use in post-production with real-time playback capability of 4k60p UHD. The demonstrator runs on Windows and uses a NVIDIA graphic card to accelerate the decoding.